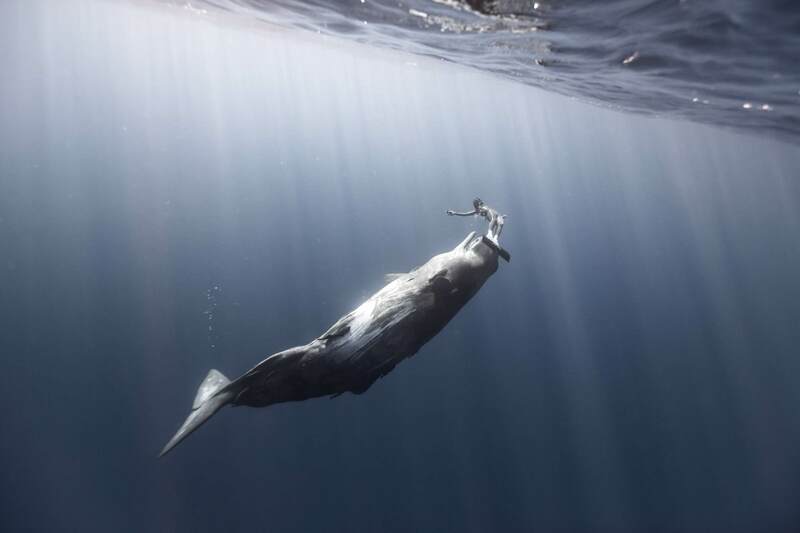 The French freedivers Alex Roubaud and Alex Voyer, friends for many years now, have traveled the world together looking for the best opportunities to pursue their art: freediving and photography. The results are remarkable. This passionate duo founded Fisheyes, a small association that allows them to showcase their most beautiful pictures. Most of their photographs highlight the interaction between the freediver and the aquatic fauna, showing the divers as the guests, for just a brief moment, in an environment that is not their own. We can witness the discrete meetings between man and the sperm whale, the dolphin or the shark, for example. 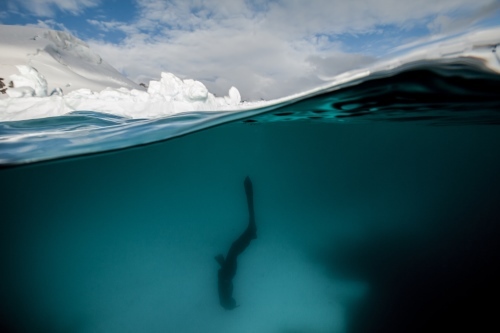 The lightness of the freediver allows him to blend in much easier, with more grace, more liberty, in the environment. There is a respect, a sense of unity with man and the subaquatic environment and they adopt a more practical and flexible approach to the sea life. They can dive faster and, free from the noise associated with scuba diving equipment, can enter into the profound silence of the submarine. They do not reach the depths reached when scuba diving but, in return, they can stay longer in the water; their sessions lasting up to 3 or 4 hours. Their pictures are taken under natural light, without any flash, and with a standard Reflex Canon camera. The frequent use of a wide angle lens called fisheye gave the name to their association. Encounter with the dolphins in Sataya, Egypt. 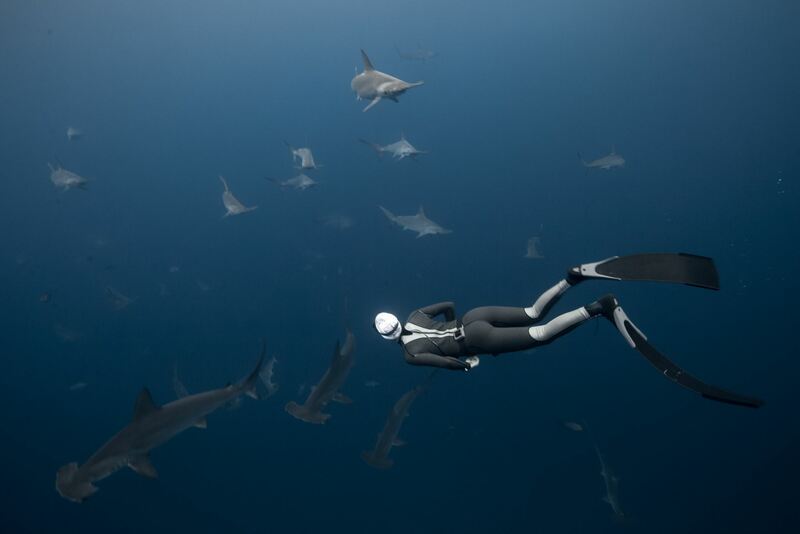 Schooling hammerheads around the island of Malpelo, Colombia. 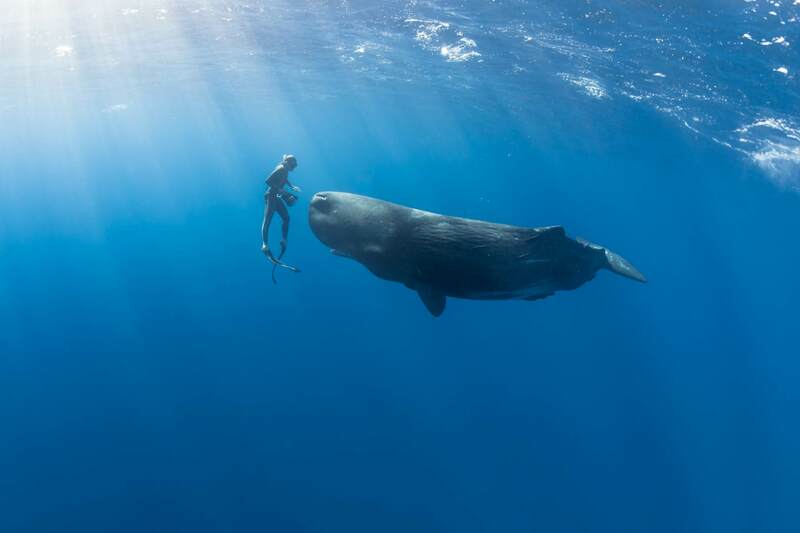 Sperm Whale in the Indian Ocean. 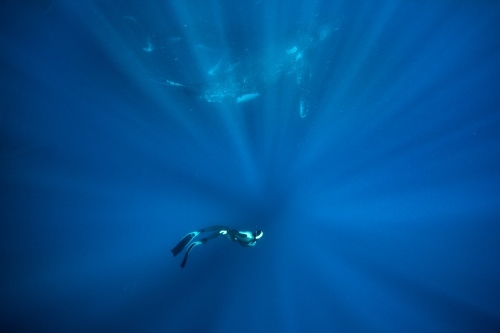 "We are freedivers full of passion. We have had the opportunity to meet some extraordinary freedivers, genius photographers, and highly rated scientists. Needless to say their enthusiasm for the oceans was contagious!" "We have been diving as a pair for long time now, which is absolutely necessary to our passionate outlook. Working together is essential. We know each other well and are able to communicate effectively, even with just a few words. We like to share our feelings at the end of every dive. 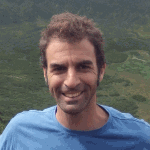 This is both very important and very gratifying." 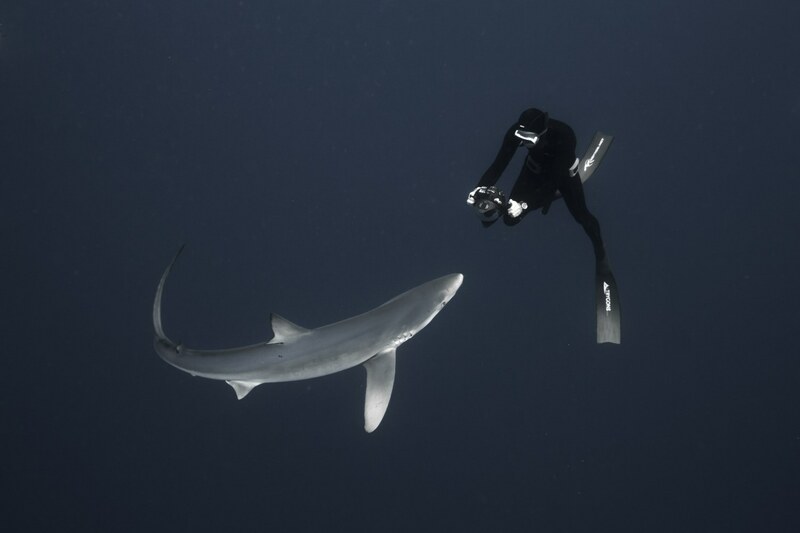 "A blue shark seen in the Azores during our stay at our friend’s place, Fred Buyle, a great photographer. We are directly aligning ourselves with his work; he gave a new breadth to submarine photography. His approach to freediving and its environment seems to be different from a scuba diver. He also brought a new dimension to freediving: that it is not an end in itself, but rather a means to improving the experience underwater." 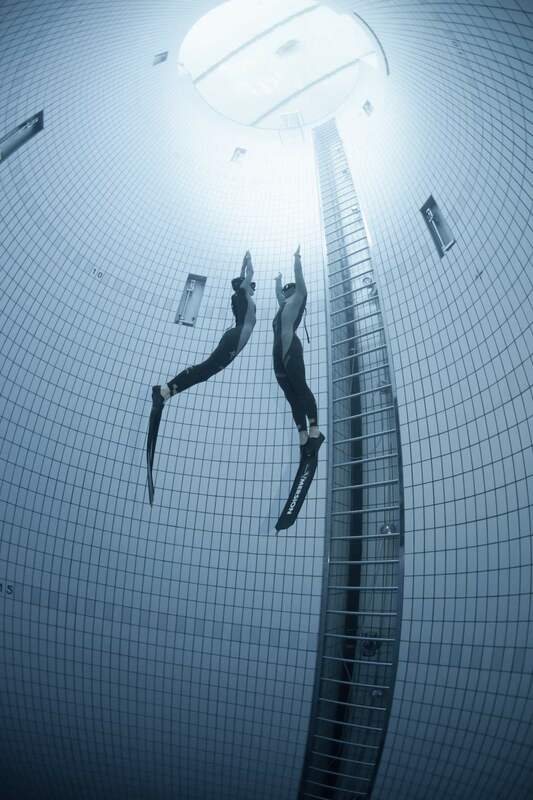 For Roubaud and Voyer, freediving is based on teamwork. They alternate their dives; one staying at the surface keeping an eye on the other who is immersed. First and foremost, this is for security purposes, but it also allows them to double the time they can spend in contact with the animals which, in turn, allows the animals to get more comfortable with their presence. "Freediving is not a dangerous activity if we respect the basic rules for security. The first essential rule is to dive in pairs. We strongly encourage anybody who wishes to try freediving to contact competent instructors and to never dive alone. Please visit the website: www.freedivingsafety.org"
Freediving necessitates training in order to get the body used to immersion and to develop the mammalian reflex. That reflex, found in most aquatic mammals and less present in mankind, lowers the heartbeat and promotes the peripheral vasoconstriction in order to consume less energy, thus allowing us to stay longer underwater. 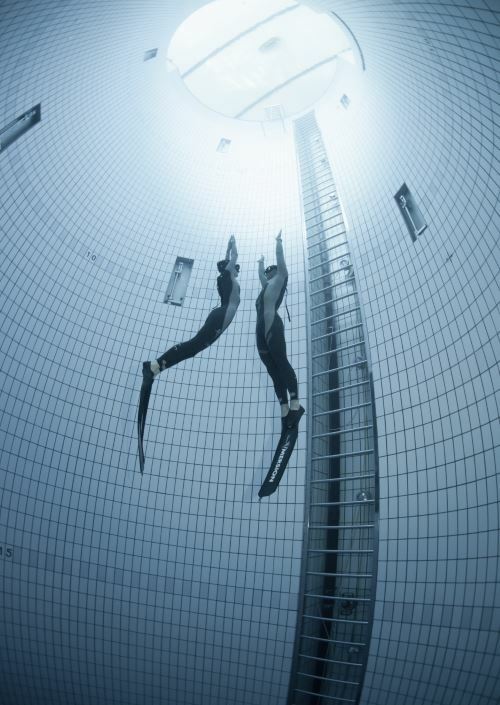 Living in Paris, this duo are training to static and dynamic apnea in the swimming pool. They also have access to a swimming pool with a depth of 20 meters near Paris. 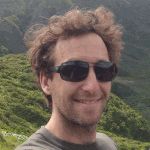 As soon as they have an opportunity they enjoy going to the French Coasts, from Corsica to Brittany. 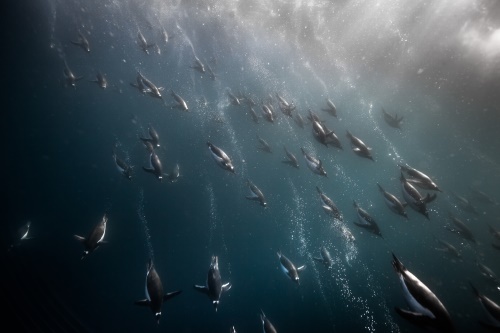 "The polar animals pictures come from the Antarctic, a place that is still preserved. I had the chance to take photographs thanks to an expedition organized by Mr. Gilles Rigaud! In this place, most animals have never been in contact with humans so the encounters are incredibly unique moments." 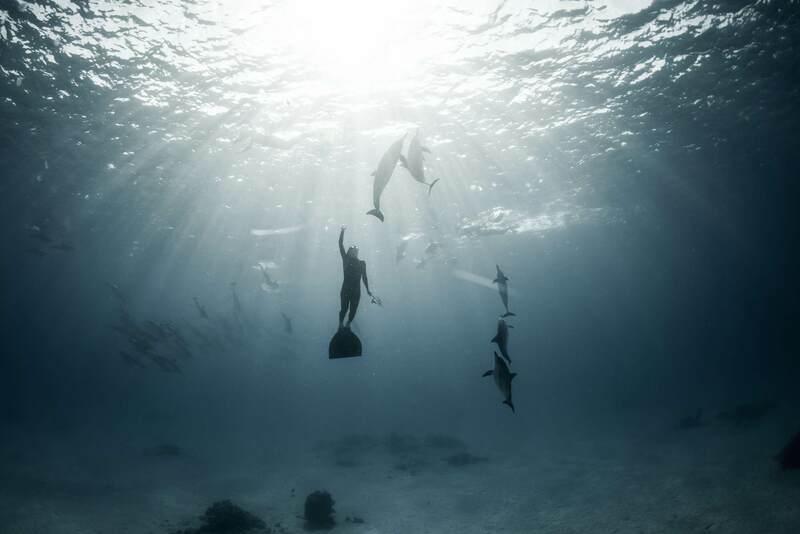 "The dolphin pictures are from Sataya, in Egypt, where I have received a proposition to mentor the freediving internship this year. The pictures, however, do not depict the reality of a place where dolphins are harassed 12 hours a day by the zodiacs who pursue them in a lagoon where they intend to rest. (We can observe the same phenomenon in the Mauritius islands as well as in Hawaii). It is completely wrong to make people believe that they will be able to swim with dolphins here. To swim with the dolphins or to encounter various other marine animals is the dream of most divers and freedivers. It is our responsibility to know the issues around the environment if we want the oceans to remain in good health."